Struggling to make reading interesting for your kids? Do you think brain fitness is just as important as physical fitness? Have you ever wished you could fit a 4-GB memory card in your child's brain for exams? Think your child is an auditory or visual learner? Think again. Last Friday night, I was fortunate enough to get to spend about two hours with an intimate social media press event for BrainFit Studio's first Brain Fitness Conference. 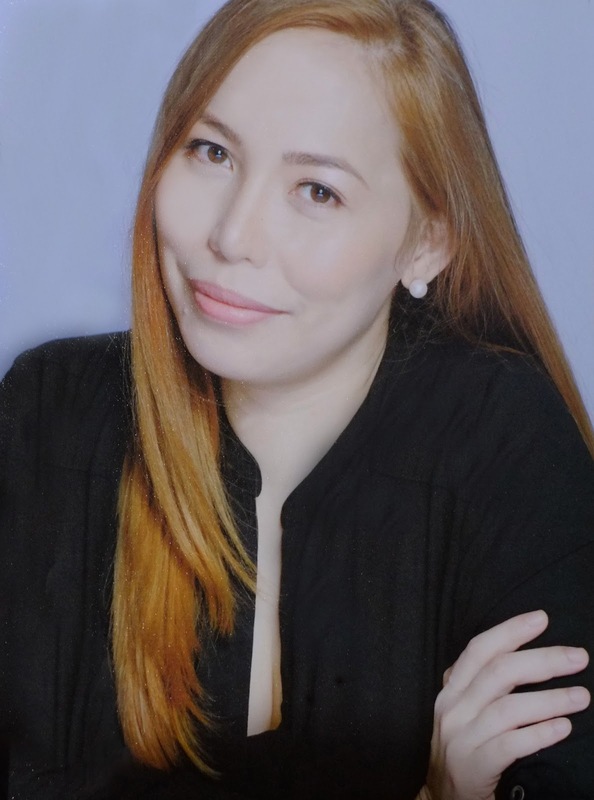 The kids had a blast with the fun, interactive activities for Brain fitness while we, the stagemoms, were busy listening to one of BrainFit's Brain Fitness experts, Dr. Marlene Teo. Learning while jumping on a trampoline. What a fun way to hook the kids in! BrainFit Studio is at the forefront of providing personalized brain training for children 4-18 years old. I like the idea that BrainFit Studio's programs are personalized and brain-based which are mostly targeted specifically to improve various aspects of brain fitness. They both have gym-based and tabletop activities wherein they give appropriate program to each child. In a class of no more than 6 kids, their program has 20 engaging and fun-filled sessions but they said that they can see significant improvements in just 6 or 7 sessions. How cool is that? Myth: Brain development peaks at 36 months and then start faltering after that. Brain exercise is just as important as physical exercise. Brain fitness is about having superior mental processes arising from more efficient and robust connections in the brain. It involves activities that strengthen existing and build new brain connections. We have to keep exercising our brain and body, regardless of our age, because physical and mental activity stimulates the creation of new neurons throughout our whole life. Motivation and enjoyment builds a smarter brain. Learning strategies are useful only if they match your child's brain fitness profile. If a child struggles to pay attention, would you know when is it serious enough to be concerned? I've learned that we need to train a child's brain by giving appropriate level of activity. Kids should also have the willingness to learn. You’ve probably heard it said that a person can’t be taught until they’re ready to learn. It makes sense, and IMHO, it’s mostly true. Why though? Why can’t a young child be taught until they’re ready to learn? If a child isn't willing or curious enough to want to know why, to want to ask questions, to want to learn, then he's not making the room in his mind for learning. If a child stops asking questions, or if one lacks motivation and enjoyment, his/her mind can’t grow. You can't just force them to fill up their brain with too much information in seconds. Also, it doesn't mean they're lazy. Ask yourself. Are they fit enough? Are they motivated? That's why it's best to feed their curiosity, provide our kids the right level of brain exercises, motivate them, and give them resources for finding the answers to their questions so they can learn anything! Apparently, yelling at kids "to pay attention" doesn't give them years of mental training. So for starters, let's stop yelling at our kids asking them to pay attention and learn to interact with them more often. Most kids learn language capacity by interacting with us, parents or adults like yaya, tito, or tita. I think it’s the interacting part that’s important because television, iPad or any other gadgets cannot replace parents as language teacher. However, as much as parents can be “stressed out” with the sloooow academic pace of their kids, most parents don't realize that their children get stressed all the more as they are the ones being measured. Also, Dra. Teo gave an example: in a setting where a child is trying to copy something from the board while listening to her teacher and ignoring her classmate making a gross sound, the noise outside the classroom, the texture of her clothes, holding head steady, holding pencil, and a lot more, that child is actually doing more than one task, and it's called, "multitasking at its best". Kids have “open” attention, which takes in a lot of detail from the surrounding environment, while adults have more focused attention, which means that they notice details that are perceived to be relevant and ignore those that are considered unimportant. 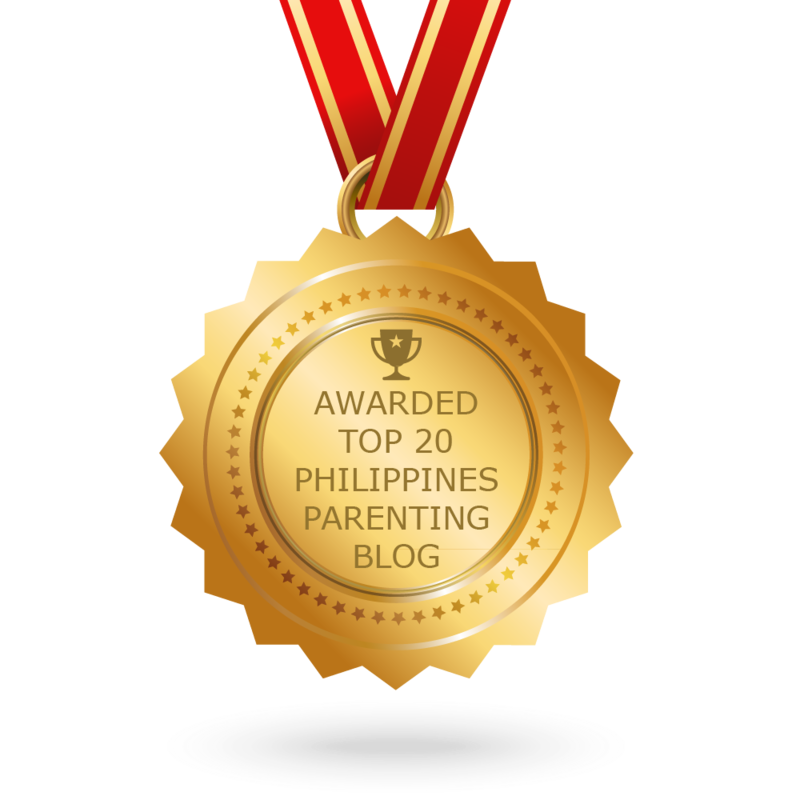 At their very young age, we shouldn't force them to be at a level wherein they will have a hard time getting into and we should give them just the right level of activity. So that when they finally finish a task and then feel good about it, they'll be more than willing to do it again and be challenged to achieve more. BrainFit Studio uses Cognitive Map. A brain’s fitness level influences the 5 pillars of cognitive development namely: attention, visual, auditory, sensory-motor, and social-emotional. The first step is via a process called “Cognitive Mapping” of one’s strengths and weakness across all the 5 brain pillars using US-qualified testing methodologies. Based on the findings, the appropriate program are then recommended to improve on opportunity areas. That said, Brainfit studio's programs help your child learn better by improving their Brain Fitness levels. Brainfit programs helps strengthen a child’s ability to absorb and comprehend information at school/tutor. Also, this media event is in preparation for Dr. Martha Burn's arrival here at the Philippines for the upcoming conference. 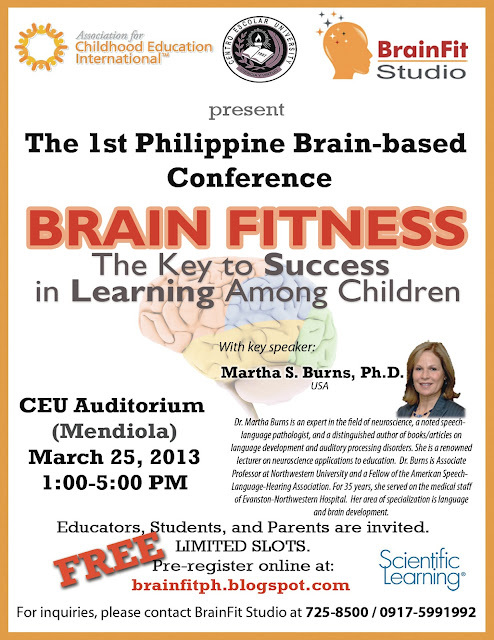 Aiming to raise awareness for brain fitness, the first ever Philippine Brain-based conference is slated for 25th of March, 2013 to be held at CEU Auditorium. The speaker, Dr. Burns, is a well known neuroscientist from the United States. Be inspired as Dr. Burns explains how we can help our kids reach their potential and how the brain actually works. Also, this is a FREE conference and all you need to is to register at brainfitph.blogspot.com. So register now because they have limited slots. hi sis, san ito malapit? Thanks! wow this is nice.. dami talagang perks pang nasa with in Manila area ka..I am hoping to see something like this sa province. 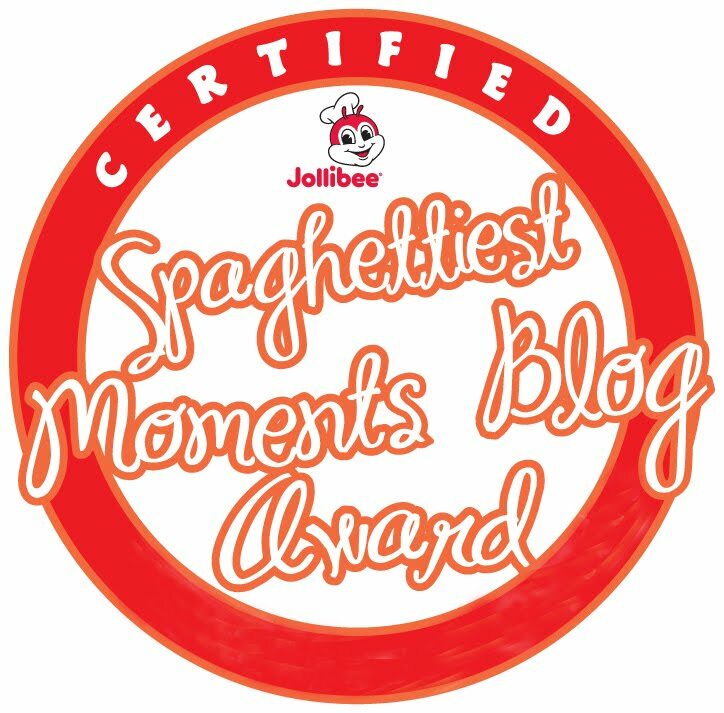 Meron nga ba? kung meron.. I'll be more than happy to share it with friends..
Trampolines are not just toys that are just used for jumping but are also used to let your kids develop strength in their legs. This is also found to be a great way to exercise. So I hope you will buy trampolines for kids.